Fruitbody medium to small sized, boletoid, without veil and ring. Some southern species have secondarily angiocarpic development and then a ring of coarse granules is observed on the stipe, where the cap margin was initially attached. Stipe solid, often tapering towards the base. Flesh variously coloured, changing or not when exposed to air. Tubes not separable from each other, instead tearing apart. Pores usually angular. Cap up to 7 cm, at first hemispherical then convex, ochraceous, pale brown, greyish brown, olivaceous brown, dark brown to blackish brown, dry, velvety but very soon cracking and white flesh is revealed in the cracks. Stipe cylindrical or slightly club-shaped, often curved and usually tapering at the base, pale yellow to yellow entirely or in in the upper half, downwards gradually becoming brownish to greyish brown, sometimes with reddish tint. 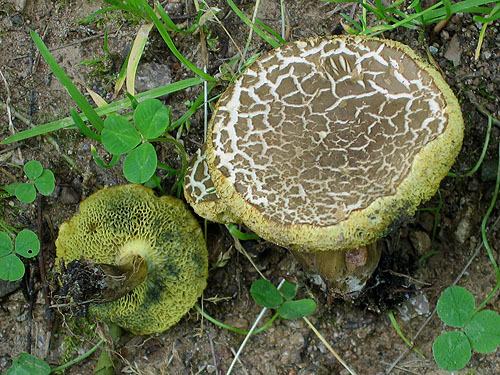 Flesh cream to yellowish in the cap, brownish in the stipe, unchanging when exposed to air. Tubes lemon yellow, later pale yellow with olivaceous tint, blueing when injured. Pores concolorous with the tubes, blueing when bruised. Smell not distinctive. Taste not distinctive. 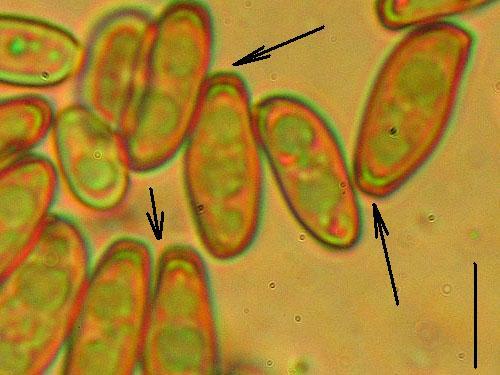 Spores 11–17 × 5–6.5 μm, smooth, truncate. Pileipellis (the cap cuticle) a palisadoderm of septate hyphae. 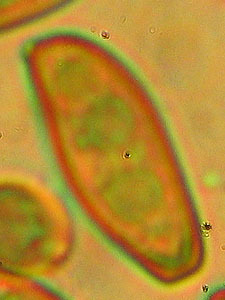 Hyphae composed of nearly ellipsoid to cylindrical, incrusted cells. Habitat. In deciduous forests, mycorrhizal mostly with oaks (Quercus). Distribution. In Europe widespread and mostly common. Similarity. Xerocomus porosporus shows similarity to many other xerocomoid species but is easily distinguished by its truncate spores. 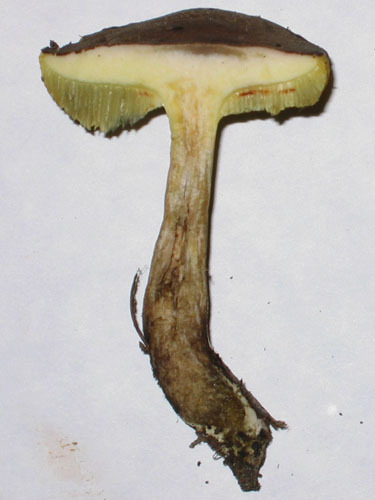 Xerocomus marekii also has truncate smooth spores, but it has reddish cap and blueing flesh. Xerocomus fennicus is the only other European bolete with truncate spores, but these are clearly striate. It also has reddish cap. Note. Some European authorities use for this species the name Xerocomus truncatus. 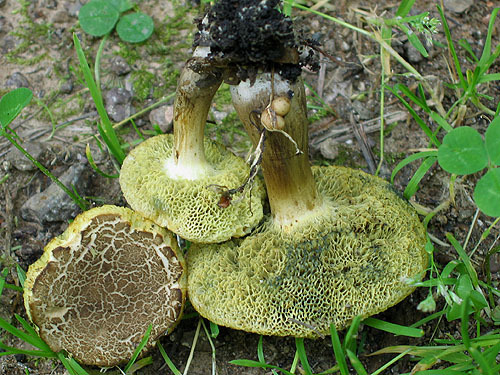 It is a different American fungus and there is no evidence so far that it is found in Europe.